Artillery cooperation training took a month to complete. This was conducted in the Middle East School of Artillery located in nearby Alamaza bordering with the desert. Every day a lorry would take us from the hotel in Helipolis (Egypt) to Almaza to learn how to direct the artillery fire. This involved exercises where we as observers, sitting in observation posts, were giving orders to correct artillery fire until the target was hit. First we had to give the battery the coordinates of the target and then order the leading gun to fire. Depending on where the explosion occurred, we would follow with a correction, e.g. "right 100, fire!" Another round would follow and each time a correction would be given, e.g. "left. 50, fire!" once the explosions were well in line with the target, further adjustments would be made depending on whether they were falling too short or too long. If too short, we would request an increase, e.g. "add 200, fire!" and if too long, e./g. "drop 100, fire!" Corrections continued to be made until the target was hit at which time we would say, "Okay, good show, target destroyed." While the lead gun's fire was being corrected the rest of the battery would follow the corrections and fire with the leading gun only when the last correction was received. It would take 20-30 minutes to get the rounds on the target depending on the precision of our corrections and firing by the gun. The firing was often affected by atmospheric conditions, especially by strong winds. The main difficulty for us was to correctly judge the distance between the target and the explosions. All this was the introduction to a job of directing combat artillery fire from the air. Italy, summer 1945. The members of No. 318 Polish Squadron. 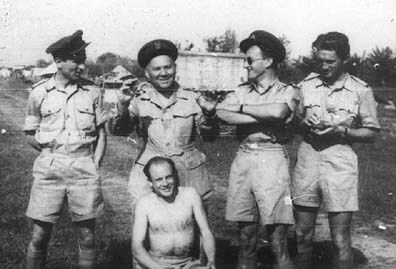 F/O Grodzinski (left), F/Lt Lutoslawski adjutant, F/O Nycz, and unidentified. Squatting is F/O Rudomino-Dusiacki. Before take-off I was nearly paralyzed by fear mixed with anticipation. There was also an element of excitement, which accompany gambling. Only this time the one was risking his life. Funny, how all this suddenly vanished once I set in a cockpit, where I became calm and methodical, busy with instruments, focused on my task. This routine of strong fear suddenly disappearing once in aircraft, stayed with me for the rest of the war. - Hello Agra, hallo Agra, keatings red section leader calling. Do you hear me? Over. - Hello keatings red section leader, receiving you very well. Over. - Hello Agra, keatings red section leaving the area. Over. - Okay keatings, good luck. Over. We approached the front line from the sea with the sun behind us. The weather was fantastic, absolutely spotless blue sky, crisp air with excellent visibility. I could see Ancona’s harbor littered with shipwrecks, its cranes twisted and broken, its buildings destroyed. Smoke from many fires covered a good portion of it. The city itself looked untouched. Despite my Spitfire’s two cannons and four machine guns, I felt defenseless, desperate to avoid being hit. Finely was close to ground and I could verify my target. Immediately I pulled up very hard momentarily loosing sight. After reaching a safe altitude I ordered the battery to fire, and circling above my target I waited for the first shell from the leading gun. There it is! Too far. I R/T and a correction and wait for another explosion on the ground. Again too far, and I sent another correction. After five or four shells, the salvo from the whole battery encircled the target and I felt enjoyment. ... I had two more targets to destroy. I gave the battery another coordinates and relocated. Once near the target, just like before I went down to check whether it was a real one or just a camouflaged dummy one. Again I found myself in a wall of fire. I was wandering how come they can’t hit me. I had a good look at my next target and pulled up. Then, the well-rehearsed procedure followed: order to the leading to fire, explosion of its shell, correction, and so on till the target’s destruction. Our artillery was shooting very well and it took only few corrections before they hit the target. I approach the third target with the same feeling anticipation and tension. I wanted strongly to fulfill my task completely. I had my doubts however, whether my luck would not run out. It seemed impossible not be hit by something of what was coming my way. Germans knew what a single Spitfire meant coming down to their position. They fired at me everything they had. And I heard and felt a thud near the cockpit. Instinctively I ducked and pulled up, trying to save my plane and myself. I leveled and looking around I gathered the situation. I decided to swoop down over the target and check it out. I went down and immediately I was engulfed in very accurate flak. I thought that this time I have had it! But to my surprise, I was able to pull up again, after I had a good look at Germans. I went up again and started to direct fire. Very often the squadron's Spitfires returned from ops with damage done by German ground fire. This No. 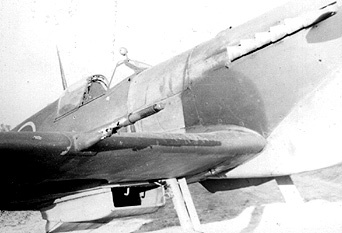 318 squadron Spitfire had to have its 20mm cannon replaced. All that time Bronek was covering me dotingly, warning me about the ground fire. He was probably more nervous than me, impatiently waiting for me to come to altitude. Again, the cooperation with my battery went smoothly and I finished my task. After 1 hour and 45 minutes we landed back at our airstrip, and Bronek congratulated me with beaming face. I was happy! Italy 1945. 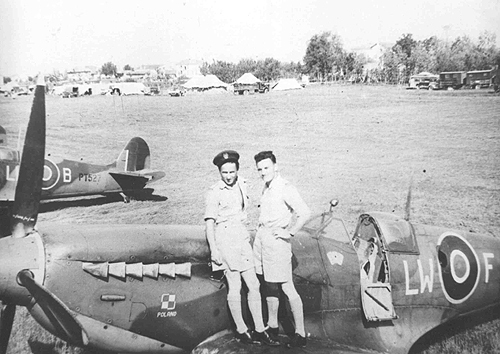 This picture shows F/Lt Jan Grodzinski (left) on the Spitfire he flew several times, LW-F MA423. Behind it is LW-B, PT527. Courtesy of John Grodzinski.